It's been a while since you switched to using an online email client like Gmail or Yahoo, and you really enjoy the convenience and accessibility. But what did you do with all of those old email messages - you know, the ones from Outlook (.PST, .OST or .MSG), or from Thunderbird (.EML and MBOX?)? Are they still imprisoned in your old email program, forever locked away, doomed to be eventually forgotten? Use PstViewer Pro to resurrect them! PstViewer Pro version 8.0 (the latest, just released) opens all of those email file formats for you, then lets you view, search, convert, and manage those emails. 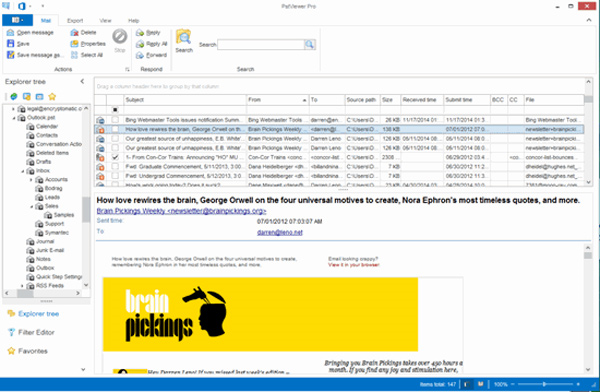 With PstViewer Pro, you'll be able view your email messages, extract file attachments in batch, search your message cache for important messages, convert the emails to useful formats like PDF, CSV, EML, DOCx, TIF, and many more! PstViewer Pro reads any Outlook .pst or .ost file, whether it was created in the old ASCII format or the newer Unicode format. People have been sending Encryptomatic odd emails formatted weirdly from all kinds of strange email applications. Hundreds of wild non-standard "exceptions" have been identified and accommodated in PstViewer Pro. There is no other are that can handle the wide range of email formats and non-compliant oddities as well as PstViewer Pro. System administrators will be pleased with the variety of command line options that are available with PstViewer Pro. Using these options, you can tightly control the functions of the program that can be accessed by your users. PstViewer Pro has menu language support for English, French, German, Arabic, Spanish Chinese, Filipino, Italian, Hindi, Norwegian, Polish, Portuguese, Russian and Ukranian. 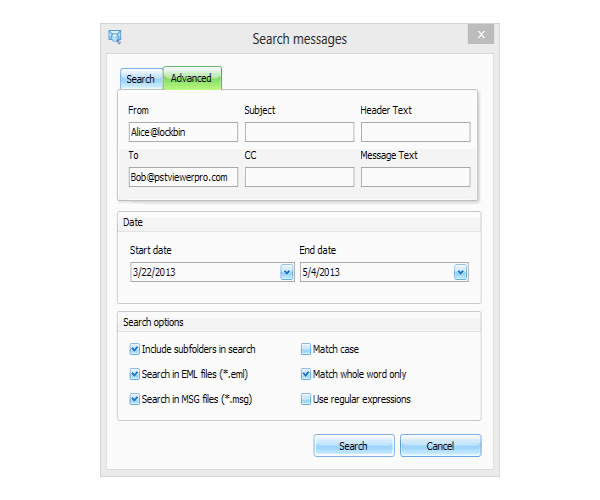 View email files in MSG and EML formats, even if they contain RTF or HTML. Quickly search messages using your own criteria. Restrict access to specific functions of the program. Convert email messages to PDF, text, and a variety of image formats. After you purchase PstViewer Pro it may be used indefinitely. PstViewer Pro is licensed per user, so if more people are going to use PstViewer Pro you will need to purchase additional copies. Online license activation is required with a hardware footprint, and 5 installations per footprint. what's this? Upgrades to future versions of the software will be free for 12 months. For versions after that, upgrades will require additional payment, which will be discounted by 25%. It will be discounted only if you've purchased the last major version. This vendor agrees to abide by the ASP's Code of Professional Conduct. Gary Smith From looking at the developer's website, I cannot tell what version this is, plus I cannot find a Changelog file. Can you please respond with the Changelog file URL (I will presume it is up-to-date for the current version number)? Thank you. 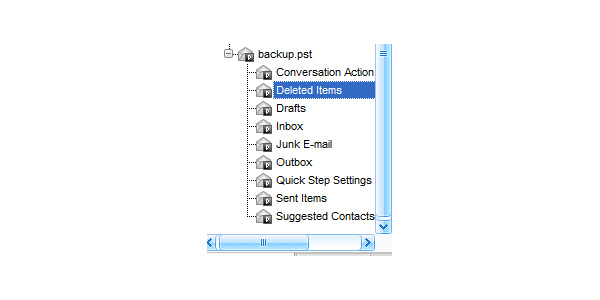 franp User Hi, can this open, navigate, deleteindividual messages in The Bat TBN/TBB files ? That would suit me, as I am considering building an e-mail archive on a mobile disk. The subsequent discussion seems to indicate that this activation scheme is no longer applicable. Is that so? "PstViewer Pro version 8.0 (the latest, just released)..."
Bertie Brummel @ Franp User: I've not tested this. However, The Bat! (at least the Pro edition) allows to export to MSG, EML and MBOX formats . See the 'tools' menu. All 3 formats are supported by PST Viewer according to their website. I'm not sure that all features (for example conversion to PDF) work with all supported formats. Christian User I put an order for PST Viewer Pro software with Paypal. No receipt, no registration code. I try ti resend code from my BDJ account. No receipt, no registration code. Nothing in my spam folder ! Constantin Florea @Christian User, I just resent you the receipt email containing the registration code. If you still didn't receive it, it could be that you are expecting it to arrive at a different email account than the email you used to participate in the promotion. Please feel free to let us know at notify@bitsdujour.com the email address where the receipt should arrive. Thanks Constantin, i have just received the registration code (No.. my email adress is correct…. No explanation…). But all is O.K. now ! "Quoted from the description above"
Thanks but I had already read the description, and that statement is why I asked because the description text is not current. If you look in the Older Comments, you will see that back on July 31st, 2017, Sepy asked what version was being offered because Sepy already had version 8. In August, there are other references to version 8, such as the comment that shows that Version 8.0.786.0 is from February 25 2016, implying this software is at least 2 years and 10 to 11 months older than "just released." The Trial is also for 8.0786.0, and its digital signature is from July 16, 2017, which would get updated periodically, but it certainly is not the same as "just released." The Changelog mentioned in older comments is in the company blog, and there is nothing recent on this software having a new "just released" version. These are the reasons I asked for a Changelog, and probably why the developer is not providing it. Thanks for your reply. Interesting info. Over the last years I very often read explanations here , that contradictious or incomplete descriptions were based on texts made by BDJ. "... incomplete descriptions were based on texts made by BDJ"
I have seen the software submission form to BDJ, and had it explained to me by developers what they can supply and what they cannot. As far as I can tell the descriptions are never written or altered by BDJ for the very reason that BDJ does not interfere with what the developer says. So I suspect that the developer did not make an effort to update their description. I can understand the human error aspect of it, but I do wish that the developer would get as involved with the current offering as they have in some of the earlier offerings. Likewise, thanks for your response. Again we thank you for the interest in PST Viewer Pro. Mustang So if I want to see a changelog I need to contact support? Not comfortable ponying up for an upgrade every 12 months when there is no clear roadmap of what has been done and at what frequency..
" we've been responding the comments directly to the commenters email address"
Sorry, but that's a very ridiculous reaction. It is more than obvious that this conversation has the purpose to keep ALL readers informed about questions asked and answered. Bertie Brummel The changelog shows, there has been no progress between 2015.06-25 and 2018-11-05. Does anyone need more reasons to pass this offer? Thank you for your suggestions. We are short staffed today to allow all employees the opportunity and the right to vote. You are correct, it should be handled as a conversation and I will try to be more responsive to the comment section going forward. In the event that we are out of the office, feel free to open a ticket at https://www.encryptomatic.com/support/ we will respond as quickly as possible. styrobrain As for "comments directly to the commenters" and my question above regarding activation, I had a very pleasant exchange with the developer's support. For me the upshot is this: two concurrent activations, 5 transitions at one's own discretion, from the 6th on one must contact support. Works for me. But if this matters to you as well, be aware that I'm merely retelling, with no authority whatsoever. Mustang I looked at your blog and the text file you sent, and both are incomplete, and the blog entries are not in chronological order. I found no entries for the new releases of v7 or v8 so I have no idea what compelling new features were added to these major releases. Just to be clear, this is the latest version of PstViewer Pro. I know there's often a concern about getting an old license. Do companies really do that to you?? Well, this is not that. Encryptomatic PstViewer Pro comes with a year of automated updates and support. North American based support is delivered by phone, email, online ticket or live chat on encryptomatic.com. This software has been updated regularly, new features added, and always backed by our attentive support team. Thanks for checking us out. We enjoy the interaction. If our software can help you get your work done, now is a good time to pick up a license. Oh, btw... don't get hung up on the major version number. This software is regularly updated. We're moving away from arbitrary major version numbers in the next release anyway, which will be PstViewer Pro 2019. You will receive the update as part of your 12 mo. maintenance and support, included in the purchase. Robert User If I have already installed the Trial downloaded from BDJ, and choose to purchase, do I just enter the license key or do I uninstall the trial and have to install a different version? Nico Westerdale Great News! Encryptomatic LLC has agreed to extend this deal for another day - Enjoy! "PstViewer Pro email viewer has become MailDex 2018." ? Clearly PstViewer Pro is not abandoned as licenses are still available on Encryptomatic store. But some Bitsters (but not me) may have enjoyed an offer for the bundle. By the way, if you're curious, MailDex adds archiving features to PstViewer Pro. Antonio Maradiaga Hello @Rober User, you do not need to uninstall the trial, simply input the registration code and the full version will be enabled. To do so, go to the Help tab, look for the registration option and click on it, a new window will open and will allow you to enter the registration code received from your purchase. If you have any issues or require further assistance, please contact our support team. George Butel 1, Is there any way to change the title format of the exported pdf files so that the titles can be something besides the subject line (or, at least, with the date in addition)? 2. I'm looking at some emails from 2002 where "[This message is on a remote server]". I would guess that those remote servers are probably wiped by now, but does Outlook save the URL of that file, and, if so, would getting that message mean merely that Pst Viewer is unable to access that url, or, when the pst file was created, was that URL down? 3. Regarding the license, every now and then I restore my complete system from a Macrium Reflect image, usually from a few months ago. If I were to activate the program on this system right now, then were to restore the system from an image of the identical system, would your servers detect that it's the same system, i.e., do you use a hardware signature to verify the activation? Or would that reduce the number of available activations, presumably requiring some kind of hassle with customer support, having to explain the situation to them? wts I bought PstViewer Pro on BDJ more than a year ago. I'm considering buying it again today because it appears that a free upgrade to PstViewer Pro 2019 with a purchase today on BDJ would be much less expensive then your usual 25% off upgrade policy when the 2019 version is released. Are you willing to give some specifics about the 2019 version's changes and improvements? Thanks. 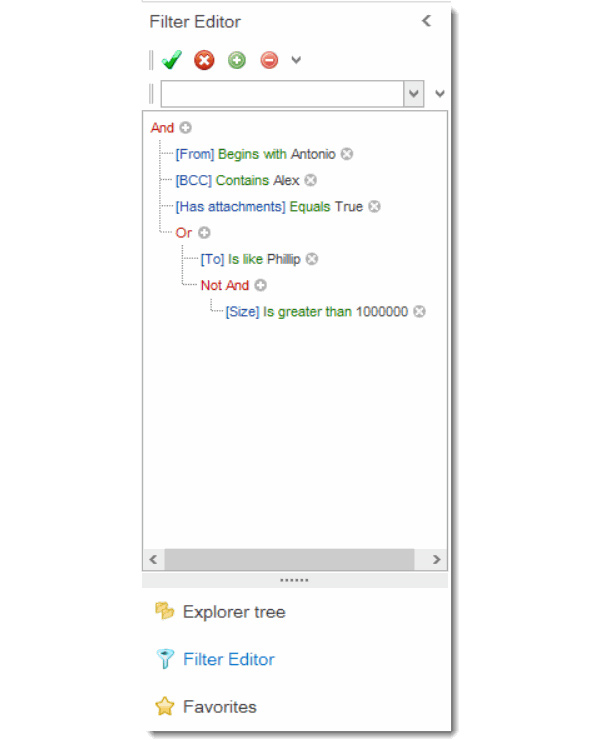 Antonio Maradiaga Hello @George Butel, PST Viewer Pro offers an extensive naming schema to change the output file name to meet your needs. 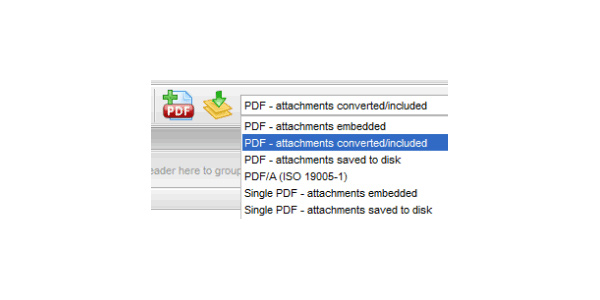 PST Viewer Pro is able to read and show files in local drives, mapped drives and USB devices. Unfortunately, it does not download from URL files nor access links and automatically downloads information. Antonio Maradiaga Hello @wts, definitely a great option to upgrade at a lower price than the usual 25% of the retail price. This purchase of PST Viewer Pro comes with a year of automated updates and support. Unfortunately, our roadmap for PST Viewer Pro 2019 cannot be shared at this time. Thank you for your interest. You said something to the effect of ignore the version number because the software is regularly updated. It looks like the version number has been the same for a while. I know that the version number is set by the developer, and therefore updates can be made without changing the version number. Is that what happened here? Darren Leno Close enough, Robert. Every developer does it a little differently. We give products a major/minor/build number, such as 8.0.705. The build numbers are what pushes out auto updates to our customers. Thanks; with all this discussion about versions and updates, I'm still don't know when the last one was. What and when was the last build number to push out auto update to customers? Darren Leno An easy way to make sure you have the latest update is to simply open PstViewer Pro, go to Help > Check for Updates. I know the version I have is the latest but I don't know when it was created, updated, or had features added. Due to all the discussion, I was hoping you could set the record straight. When were the last features added? Jeff User I just ordered this program and confirmed that my credit card was charged but I haven't received a registration code. Constantin Florea @Jeff User, I just resent you the receipt email containing your registration code. Ed Ward Hi - does this work with Gmail? I can't tell from the product descriptions. William Henry Can I save my Outlook's saved .PST files to either a .PDF or .DOC format and then delete them from Outlook?